The Assam Government today accepted the National Democratic Front of Bodoland (NDFB) ceasefire offer following the arrival of the formal communication from the militant group late last night. In the wake of nearly five lakh seats remaining unfilled in private engineering colleges across the country, the Supreme Court today issued notices to the Centre and All-India Council of Technical Education (AICTE) on a petition seeking national level combined entrance test (CET) for management quota seats. A few months after being commissioned into the Army and facing flak due to doubts over its capabilities, the main battle tank Arjun will undergo its first acid test in combat conditions in December. Days before she arrives here on a state visit, New Zealand Prime Minister Helen Clarke seems to have herself cast a shadow over the visit with her controversial remark over Kashmir. The Supreme Court today stayed the order of the Nehra Commission, restraining an English daily from reporting its proceedings and issued notices to the panel, Punjab Chief Minister Amarinder Singh, his son Raninder Singh and the state government on a petition by the newspaper. An emotional Home Minister, Mr Shivraj Patil, yesterday charged his colleagues in the Congress party of not defending him sufficiently in the media. Ending the market speculation on increase in fuel prices, the government today decided not to increase petrol and diesel prices, at least for the next fortnight, and asked the oil companies to bear the burden of the increase in crude oil prices. Jammu and Kashmir Government has urged the Centre to declare a special economic package for the state on the lines of the north-eastern states. A military court holding court martial proceedings against Maj Surinder Singh in Siachen fake killings case today allowed the prosecution to proceed ahead overruling the objections raised by the defence regarding validity of the General Court Martial (GCM). In a strong plea to Union Labour Minister Sis Ram Ola, the All-India Newspaper Employees Federation has urged the setting up of wage board for journalists and non-journalist. The British Government has eased uniform rules in its army to suit the needs of Sikhs in order to attract more members of the community into the British Armed Services. The Bharatiya Janata Party today came out strongly against the holding up of a film on Jai Prakash Narain and the removal of NDA government appointees from important positions, accusing the government of being "intolerant to alternative or independent views". A record number of 17,921 units of blood were donated at a mega blood donation camp organised by the Shah Satnamji Green S. Welfare Force at Sri Gurusarmodia in Sri Ganganagar district of Rajasthan on October 10, according to a delayed report received here today. The CBI today moved the Supreme Court against the Patna High Court order granting bail to RJD leader Rajesh Ranjana alias Pappu Yadav, which was subsequently suspended by the apex court. The world famous Jim Corbett National Park reopened for the public. On the first day of the peace talks today, Andhra Pradesh Government and the People's War (PW) formally signed on the ceasefire agreement, which will be in force for a period of three months. During the day-long discussions at the Dr M.C.R. Human Resources Development Institute here, government representatives, including Home Minister K. Jana Reddy and People's War delegates led by its state secretary Ramakrishna formalised the modalities for the for the negotiations. According to the understanding reached, the PW would refrain from violent activities during the talks period, and would not prevent politicians, elected representatives and government officers from travelling in remote villages. The government agreed to put a stop to all combing operations and encounters and police harassment of PW sympathisers. The PW, which wanted the government to address the revolutionary party henceforth as CPI (Maoist) Party following the merger with the Maoist Communist Centre, lodged its protest against laying the foundation for Pulichintala irrigation project by Chief Minister Y. S. Rajasekahra Reddy today. The PW is opposing the project aimed at stabilising the irrigation facility to the delta region in coastal Andhra. The first phase of the talks is expected to last for three days. Talking to reporters, Chief Minister Tarun Gogoi said he had received the letter from the NDFB top brass offering ceasefire late last night and would be forwarding the same to the Centre to frame the ground rules. “With this, only one militant group, the ULFA, is outside the purview of the ceasefire as all other militant groups of Assam have ceasefire with us,” he said asserting that the situation would improve in the state. The NDFB had caused mayhem in Assam on the first week of this month, killing at least 70 persons after triggering more than a dozen bombs in a span of 48 hours. “Naturally we will reciprocate to their gesture but the ground rules will be framed by the Centre,” Mr Gogoi said on the sidelines of the North East DGP's meet, which was inaugurated by him at the Assam Police headquarters. 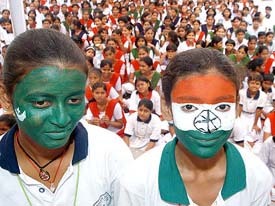 “Like the Naga peace process, the Indian government will frame the ground rules. It is going to follow the same way,” he said. A Bench of Mr Justice Y. K. Sabharwal and Mr Justice D. M. Dharamadhikari also issued notice to the Universities Grants Commission (UGC). All the respondents were directed to file affidavits placing their views on the petition by the All-India Medical and Engineering Colleges Association (AIMECA), seeking a CET for management quota seats also. The AIMECA counsel, Mr Mukul Rohtagi, told the court that due to the absence of a national level CET for professional courses like medical, engineering, dental, architecture and others, especially the management quota seats, about five lakh seats in over 1100 private institutions had remained unfilled this year. “At present the admissions are made on the basis of All-India Engineering Entrance Examination (AIEEE) for engineering courses and Pre-Medical Test (PMT) for medical colleges by the Central Board of Secondary Education. But the tests do not cover the management seats,” he said. A few months after being commissioned into the Army and facing flak due to doubts over its capabilities, the main battle tank (MBT) Arjun will undergo its first acid test in combat conditions in December. The Chief of the Army Staff, General N. C. Vij, said here today that the heavy-armoured MBT would be put to field trials "sometime in December." Indigenously developed by the Defence Research Development Organisation (DRDO), Arjun has not received a positive response from the Army, which feels that it is a few tonnes too heavy for combat operations. Speaking on the sidelines of a foundation stone laying ceremony for the Army Technology Centre here, General Vij defended the MBT, but also cautiously pointed out that it was still to be stabilised as a combat vehicle. "In terms of defence research I think we are doing pretty well. Over the years we have refined and modernised our concepts... You have Arjun, which will go to field trials in two months time, it is an excellent combat vehicle. The field trials will test the endurance and perfection of the tank," the Chief of the Army Staff said while adding, "As soon as it is stabilised, it will be good". The Army Chief also disclosed that two medium and light bullet-proof vehicles had also been developed to equip the Army's field forces with strong, mobile cross-country vehicles. Developed by the research and development wing of the Army, "the 'Hunky' and 'Tuffy' are Indian prototypes of the American anti-insurgency combat vehicle 'Humvee'," General Vij said, adding it was "a big step" taken by the EME Corps. The vehicles were designed for counter-insurgency and small-arms fire and would clearly be a cutting edge for our forces, he said. Hunky, developed at a cost of Rs 14 lakh, provided "high degree of protection against small-arms fire and splinters of improvised explosive device blasts, seating a crew of six." 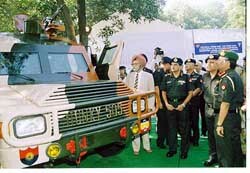 Tuffy, a light bullet-proof vehicle, developed at the cost of Rs 12 lakh, was mainly to counter insurgency and was protected against small-arms fire. The top brass of the Government of India is “surprised” over Ms Clarke’s remark which she made in New Zealand Parliament a few days ago during a debate wherein she said that Kashmir was not the internal matter of India, but an international issue. Such a strong remark by New Zealand Premier has foxed the Government of India. Two top officials of the Government of India, when asked by this correspondent whether New Delhi would call off Ms Clarke’s visit in the wake of her provocative remarks, replied in the negative. “Diplomacy is not conducted in such a manner. A country has every right to have its individual opinion whether we agree with that or not,” an official remarked when asked about the possibility of India cancelling the New Zealand Premier’s visit. It is understood that the Indian side will strongly convey to Ms Clarke its viewpoint on the issue. Ms Clarke arrives here on October 17 for a five-day visit which would be the first India visit by a New Zealand Premier in almost two decades after Prime Minister David Lange visited India in April 1985. During the visit, Prime Minister Clarke will call on the President and hold talks with Prime Minister Manmohan Singh. External Affairs Minister K Natwar Singh will call on the visiting dignitary. The commission was set up by the Punjab Government in 2002 to probe the allegations of foreign currency transactions against Raninder Singh. A Bench, comprising Mr Justice N. Santosh Heged and Mr Justice S.B. Sinha, however, said the commission would continue with its proceedings as usual. The commission, headed by Justice B.S. Nehra (retd), on October 12 had passed an order restraining the newspaper from reporting its proceedings after a controversy over a news report pertaining to the subject matter of the inquiry before the panel. Punjab’s Additional Advocate-General Atul Nanda told the court that the respondents would submit their replies but the commission should be allowed to continue with the inquiry proceedings. Aggrieved by the alleged “gag order” against it, the paper today approached the court, contending that the order tantamount to curtailing its fundamental rights of freedom of expression. The notices to the respondents were issued when senior advocate Arun Jaitley appearing for the newspaper made a special mention of the filing of a petition against the “gag order”. The order was passed by the commission on Raninder’s application, raising certain objections to the reportage of the newspaper. Upset over the bad press he has been getting about his handling of the Home Ministry, Mr Patil believes his party colleagues share the same perception. He was also disturbed that a deliberate attempt was being made to drive a wedge between him and Defence Minister Pranab Mukherjee. ‘‘May be, you also have doubts about me,’’ Mr Patil is learnt to have told a group of party leaders yesterday, pointing out that though his ministry had significant achievements to its credit, these were not reflected in the media. The Home Minister's emotional outburst came at a special internal meeting held at the AICC headquarters for which Mr Patil was extended a special invitation. Mr Patil's remarks comes at a time when he is under fire for his poor performance as Home Minister, resulting in speculation that he could either be moved to the Defence Ministry or as Maharashtra Chief Minister if the Congress-NCP form the next government there. Organised by the AICC's media department, the meeting is the first in a series of similar interactions which the party plans to hold with other Congress ministers. The basic objective is to have an ‘‘institutional contact’’ between the party and the government and ensure proper information sharing between the two. It was decided to begin with the Home Minister but other senior ministers will also be invited for similar briefings in the coming weeks. Mr Patil was greeted with a full house. Among those present included former and present media department heads and spokespersons like Mrs Ambika Soni, Mr Kapil Sibal, Mr. Salman Khursheed, Mr Satyavrat Chaturvedi, Ms Girija Vyas and Mrs Jayanti Natarajan. Mr Sanjay Baru, the PM's media advisor, was also present. Mr Patil gave them an extensive briefing about the ‘‘improving’’ situation in Manipur and Jammu and Kashmir and how his ministry had handled these sensitive states. Mr Patil, it is reliably learnt, got quite emotional towards the end of his two-hour briefing, saying that irrespective of his ministry's achievements, he was invariably panned by the press. In this instance, he pointed out how he was criticised when he did not go to Manipur immediately after trouble broke out there and was at the receiving end when he eventually did go to the trouble-torn state. He explained that he had delayed his visit to Manipur as he did not want to undermine the state government. The correct picture is just not emerging in the press, he felt. Similarly, he said, the press was full of stories that he was ‘‘summoned’’ by Congress president Sonia Gandhi for his mishandling of the Manipur and Kashmir situations when he met her recently to discuss the Maharashtra elections. Again, there was no attempt by the party to correct this perception. The Cabinet Committee on Economic Affairs (CCEA), which met here today under the chairmanship of Prime Minister Manmohan Singh, rejected the proposal to increase petrol and diesel prices and to cut down customs duty on petro products. The oil companies had requested the Petroleum Ministry to allow them to hike petrol prices by Rs 1.88 per litre and diesel prices by Rs 3.30 per litre in view of the international oil prices breaching the 55 dollar-a-barrel mark. The ministry had, however, recommended increase in diesel prices by Rs 1.60 per litre and petrol by Rs 0.65 per litre, besides a cut in the customs duty and sharing of the remaining burden by the oil companies. “The CCEA has decided that for today the prices of all petroleum products will be held at the same level. There will be no increase for this fortnight,” Petroleum Minister Mani Shankar Aiyar told reporters after the CCEA meeting. Public-sector oil companies were to meet today to review prices of petrol and diesel, which have remained unchanged since August 1 despite crude prices rising by as much as 20 dollars a barrel, leading to a Rs 2300 crore loss in revenue. Earlier, the Petroleum Ministry was not in favour of raising the fuel prices in view of inflation still hovering above 7 per cent, and had proposed slashing customs duty on crude, petrol and diesel and cutting excise duty on LPG and kerosene to offset the hike in crude prices, but the CCEA decided against any mid-course correction. In this regard, Jammu and Kashmir Handicrafts Corporation Chairman Haji Abdul Rashid Dar called on Congress President Sonia Gandhi and made the plea for the development of the state. He informed Ms Gandhi about the unemployment problem in the state. Mr Dar, who discussed the overall situation of the state, including party matters, told Ms Gandhi that the ban on shahtoos had affected the people attached with the trade. "Lakhs of people were involved in the trade," he said and sought her intervention in getting the ban lifted. Earlier, Mr Dar met Union Textile Minister S. S. Vaghela and requested for opening of new sales outlets for Jammu and Kashmir handicrafts throughout the country. Brig A.D.S. Grewal, heading a seven-member jury, overruled the objections after hearing advise from judge advocate S.V. Rao, who said the defence objections were baseless. Stating that the wages were last revised seven years ago, the federation in a memorandum to the minister said the wages in the newspaper industry were based on an inquiry which commenced a decade ago when the previous board was set up. Delivering the first annual Sher-e-Punjab Maharaja Ranjit Singh Memorial Lecture on Anglo-Sikh relations organised by the Maharaja Ranjit Singh Trust here today, British High Commissioner Michael Arthur told members of the community that his government was trying to attract more Sikhs to joining its army. "Modern-day Britain has not lost the military link with the Sikh community. For those serving, we have adapted our uniforms to suit their needs. We will shortly be recruiting a Sikh into the Services Chaplaincy Department to provide suitable guidance and pastoral care for the growing Sikh military community," he said. Speaking at the function, Chairman of the National Commission for Minorities Tarlochan Singh requested the British Government to form a separate Sikh regiment in its army to keep the traditional bravery of the community alive. Chairman of the trust K.S. Bains told The Tribune that a plot of 1,000 square yards on the Deen Dayal Upadhyay Marg in Delhi had been allotted on which the trust proposed to construct a Rs-3.5 crore Ranjit Singh International Heritage Centre. Besides organising memorial lectures on Maharaja Ranjit Singh, the trust also proposed to hold annual sports tournaments in wrestling, polo and hockey. The first Maharaja Ranjit Singh Hockey tournament would be held in February 2005, he said. The principal Opposition party raised questions over the "conscience" of Information and Broadcasting Minister Jaipal Reddy over the "censorship" of the film on Emergency, pointing out that he himself had gone to jail during that period. Addressing newspersons here, BJP general secretary and spokesman Arun Jaitley also targeted Punjab Chief Minister Amarinder Singh over the issuance of "gag orders" to a newspaper by a commission of inquiry probing allegations of irregularities in transactions by his son. The camp was organised to pay tribute to Sardar Maggar Singh, father of Sant Gurmeet Ram Raheem Singh, head of the Dera Sacha Sauda in Sirsa district of Haryana. Earlier, the organisers had found their name in the Guinness Book of Records when they collected 15, 432 units of blood at a single camp. The camp was inaugurated by the Sant, whose family members were among the first to donate blood. Prime Minister Manmohan Singh today greeted President A.P.J. 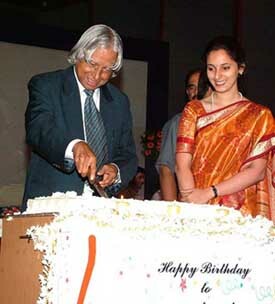 Abdul Kalam, who turned 74, and wished him many more years of distinguished public service. Regretting his inability to extend greetings in person as the President was out of the Capital, the Prime Minister said the people would always cherish his contributions to the country. Pappu Yadav, a candidate of the RJD for Madhepura Lok Sabha byelection, is an accused in the CPML leader Ajit Sarkar murder case. The Supreme Court issued notice to Yadav asking him to submit reply in four weeks.